Upcoming gigs, late 2010! Sydney & Canberra! Now with added November! I've got a few gigs coming up really soon! 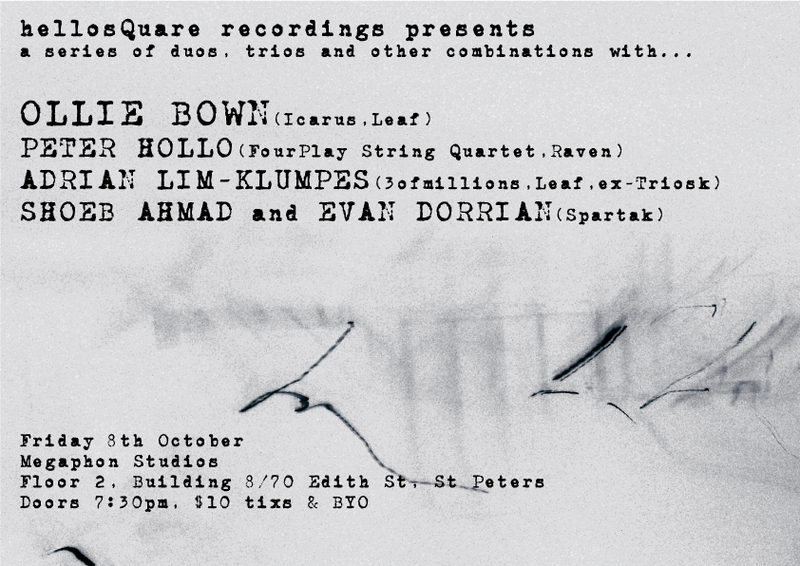 First one is THIS SUNDAY, the 3rd of October, at the semi-secret b0hemian gr0ve in Surry Hills. You might want to email me or something to find out exactly where it is. I'll be playing around 7:30pm or so. …And it's gone! And was described by the 'grove as a "hypnotically beautiful set". ACCOLADES! Second is a huge event which all involved are hoping that, um, people come along to! Featuring the wonderful Ollie Bown of Icarus, now based in Melbourne, along with Shoeb Ahmad and Evan Dorrian of Spartak and Adrian Lim-Klumpes of 3ofmillions. 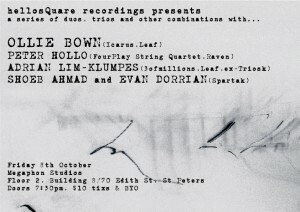 This semi-ad hoc quintet will perform in various different duos, trios, and as a full group, improvising around cello, piano, guitar, drum kit, many pedals and laptops, along with Ollie's algorithmic rhythms and responsive computer programs. Support will be from the glitchy hip-hop of Cleptoclectics. Best of all, the setting is the wooden-paneled surrounds of Megaphon Recording Studios, at Floor 2, Building 8, 70 Edith St, St Peters. Shoeb put together a special FREE download compilation for this show, with almost all exclusive tracks. An unreleased Raven track and tracks by the other performers can be found here – download now! Outside of Sydney OMG, on Friday the 22nd of October I'm playing another solo gig, this time in Canberra. Courtesy of the aforementioned Shoeb Ahmad, it's part of his series of sound gigs at the Street Theatre, and should be awesome. Will update with further details, but also playing will be a string quartet by Julian Day, and the beautiful piano post-rock of Sophie Hutchings (with yours truly on cello). And finallllly, on Friday the 19th of November I'm playing at the Sound Series at Hardware Gallery, 263 Enmore Rd, Enmore. This is an awesome gallery space and they hold fantastic gigs there, so it's highly recommended – plus of course I'll be playing! More details as they come for these later gigs, but that's a good ol' summary.